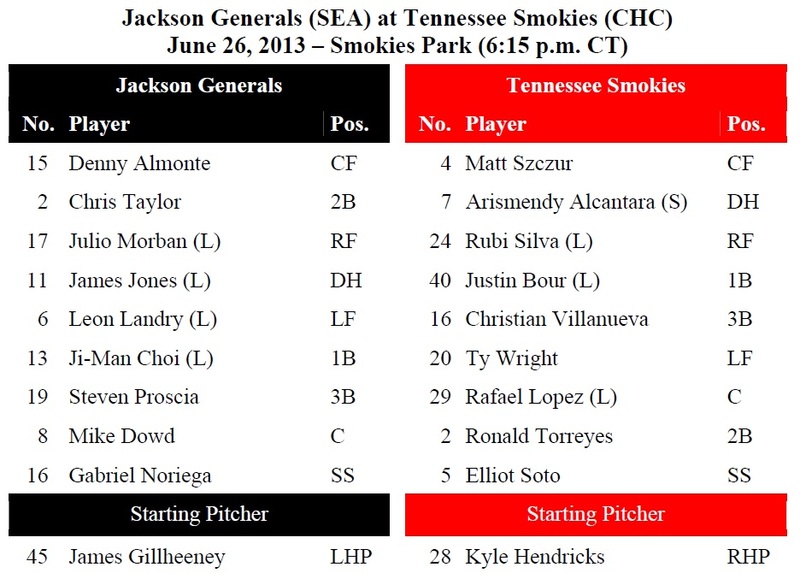 TODAY’S GAME: the Generals continue a road series tonight with game #3 of a 5-game series at Tennessee against the Smokies…this is the 13th of 20 meetings between the clubs (3-9) and 2nd series played at Smokies Park… 25-year-old lefty James Gillheeney starts game 3 of the series…this is his 14th start of the season and 9th for Jackson…this is his 3rd career start against Tennessee and he is 0-2 with a 7.06 ERA in those starts. GENERALS RECAP: The Generals rallied from a 6-2 deficit to tie the game with a run in the top of the 9th, but the rally fell short as Jackson lost to Tennessee 7-6 in 14 innings on Tuesday night. Starter Anthony Vasquez (4.2,8,6,4,2,4,2HR) made his Double-A debut this season, allowing 6 runs (4 ER) on 8 hits in 4.2 innings, but didn’t figure into the decision. Relievers Moises Hernandez (2.0,1,0,0,0,0), LH Kyle Hunter (0.2,0,0,0,1,0), RH Carson Smith (1.2,0,0,0,0,3), RH Tyler Burgoon (2.0,0,0,0,1,3) and RH Stephen Shackleford (2.0,1,0,0,2,3) combined to limit the Smokies to only 2 hits and striking out 10 over 8.1 innings in relief. RH Andrew Kittredge (0.2,2,1,1,0,1) recorded the loss allowing the winning run to score with 2 outs in the bottom of the 14th. CF Denny Almonte (2×6, 2B, RBI), LF Leon Landry (2×6, R, RBI), 1B Ji-Man Choi (2×3, R, 2B, RBI, BB) each recorded 2 of Jackson’s 9 hits. 3B/1B Ramon Morla (1×5, 2 R, HR, RBI, BB) hit a solo home run with 2 outs in the 1st inning to give Jackson an early lead. 2B Chris Taylor, who made his Double-A debut after being promoted from Single-A High Desert, went 1-for-6 with a run scored. 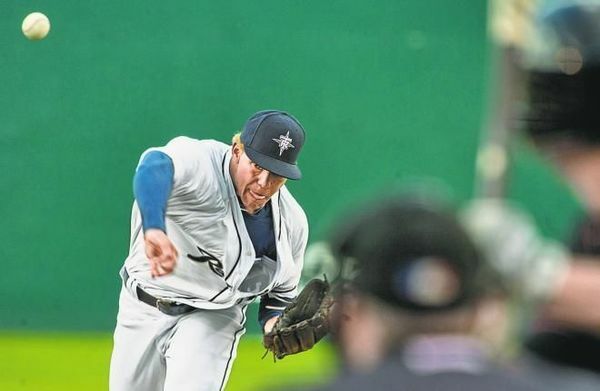 YOU ALREADY KNOW…that the Generals fell 7-6 in 14 innings yesterday and it was the longest game of the season, but DID YOU KNOW?…that the Generals 2-run first inning meant that Jackson has now scored in the first inning 13 times during 22 June games this season. NEWS & NOTES: 30 of first 73 games have been 1-run games (10-20) which is the 2nd in all of minors…42 of 73 games have been decided by 2-or-fewer runs (13-29) and 7 have been extra-inning games (2-5)…In games decided by 3+ runs the Generals are 19-12. • ALUMNI REPORT: Tacoma RHP Taijuan Walker tossed 6 shutout innings, giving up just 3 hits with 2 walks and 4 strikeouts last night in Tacoma’s 1-0 win over Fresno in his Triple-A debut. He threw 87 pitches, 56 strikes. Of the 23 batters he faced, he threw 16 first-pitch strikes. • YOUNG GUN: 21-year-old OF Julio Morban has hit safely in 4 of his last 6 games and ranks T1st in the SL with a .317 batting average. Morban is also the 5th-youngest player in the Southern League this season. • MIGHTY MOUSE: SS Chris Taylor had his 4-game hitting streak end Monday, but has reached base safely in each of his first 6 Jackson games, batting .227 with a .370 on-base percentage. • MR JONES…MR JONES: OF James Jones was 0x5 yesterday and saw his 5-game hitting streak end, during the streak he batted .421 (8×19) with 3 runs scored, 1 double, 2 home runs and 6 RBI. • WE GOTCHA! !…Jackson catchers lead the SL catching 50.0% of base stealers (36 CS, 72 Att). The next closest is Mobile which is throwing out 32.5% of base runners.